The soul stompin', rock 'n' roll pulse of Detroit, Gino Washington, is brought to life, for the first time as a full-length, on Norton Records' collection of early singles and unreleased master recordings. 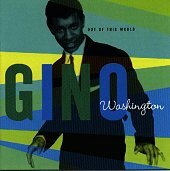 Here is the definitive Gino Washington collection that will have you dancing, singing, and jumping around to the classic rock 'n' roll sounds of the sixties. The title track opens the album with a sweaty, sock-hop feel that is sure to make the girls melt and the boys anxious to take a girl by the hand and dance. Gino's soothing, soulful voice has the punch it needs to make you jump, while his backing band is as precise and concrete as a wall of bricks. The horns add depth while the rhythm section is all about making you want to dance. "Gino is a Coward" is another sock-hop-rock ditty that is as powerful as they come. This bouncy love number has the spice and kick to make you move, and the classic, timeless feel that will ensure that you'll be enjoying the sounds of Gino for some time to come. And if that weren't enough, "I'm Coming Home" just keeps the good times coming. This time around back-up singers help fill the sound out, while the band is still as relentless as ever. Here is proof that true soul and rock go hand in hand. And, nobody does it finer than Gino Washington. "Now You're Lonely" is a slow, bouncy rocker that is still infectious and dance-crazy, like the rest of the tracks on this album. But, this time the song is slow enough to really absurd, as every note, backing vocal, and word from Gino flow through the body with heat and passion. You can't help but be taken by the amazing, soothing vibe the song possesses. "What Can A Man Do" is a soft, slow, organ-lead ballad that will have your feet tappin' to the bouncy drum beat and your ears focused on Gino's soulful voice, while "I'll Be Around (When You Want Me)" is a number that meets the ballad and the bouncy rocker halfway. Gino does it with perfection on this timeless treasure. Norton Records knows where the rock 'n' roll is and so should you. This tremendous collection is as good as it gets and shouldn't be passed on. May real rock 'n' roll live on forever. I'll give this album an A+.